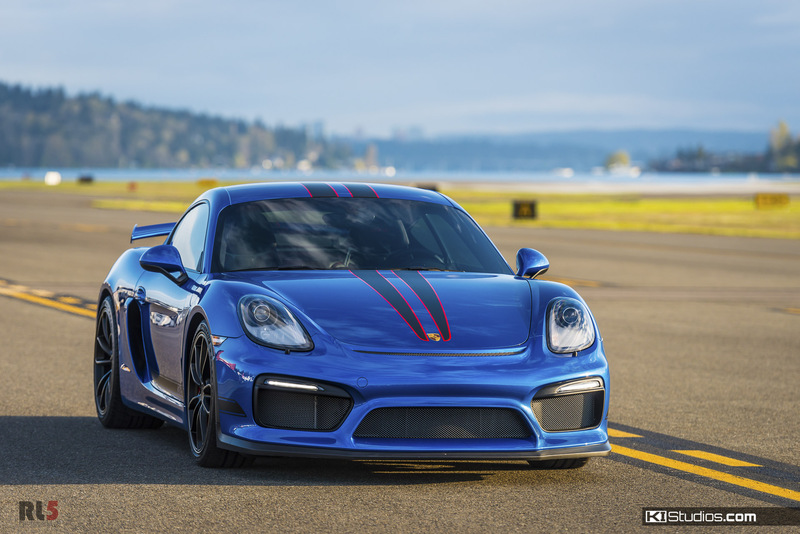 One stunning Porsche 981 Cayman GT4 rocking a set of our 007 Scuderia-style stripes. This is also a 2018 photo contest winner. When we were selecting the two winners of our 2018 photo contest the criteria was solely based on which were the best photos. We weren’t choosing based on the what car was in the photos or what stripe kit the car had. Similarly, the only rule was that the car model had to have a KI Studios kit designed for that specific model. The two winners were very clear to us. They are the Porsche 981 Cayman GT4 you see here as well as the black Ferrari 458 Italia. 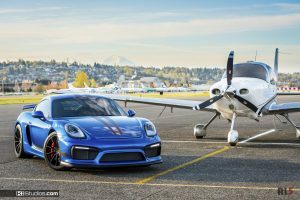 As soon as we were done choosing the two winners we promptly realized both cars were rocking our Scuderia style stripes. In a perfect scenario we would’ve liked the two winning photos to be showcasing two different kits. But at the end of the day, these are the two best photos. It’s only fair. This does show the massive popularity of these dual over the top stripe kits. 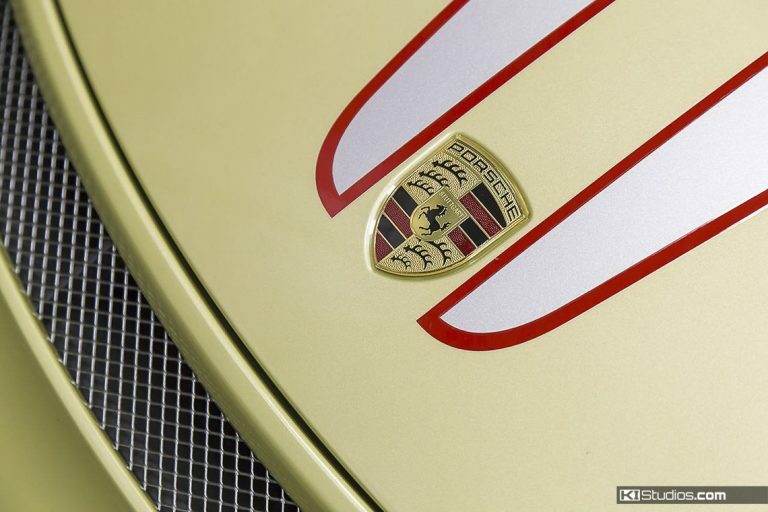 It’s originally a Ferrari design stripe, but it has proven to be well-loved by most Porsche owners we serve. Luckily for us, the two winning photos also happened to come as a set — each with at least 3 photos. That’s great. Good for our gallery features. So here we have it. 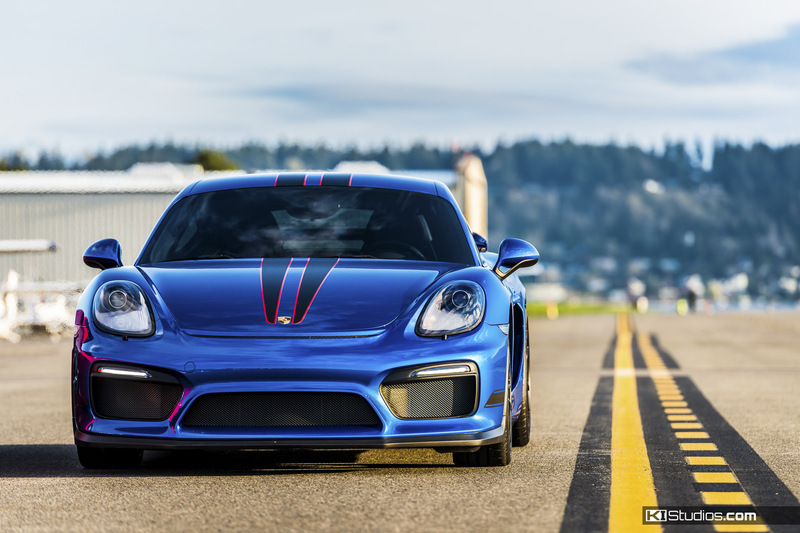 This is a Porsche 981 Cayman GT4 with our dual color Cayman GT4 007 stripe kit. Just like the Ferrari, the main color stripe on this GT4 is matte black. However, to enhance the colorful look, in contrast with the Ferrari’s monochromatic approach, this car offers up a hint of red. The red outline adds a nice touch to the blue base color. Oftentimes, red and blue are hard to pull off as too much of one or the other yields a car that looks like Superman. But add that red rather sparingly and the results are outstanding as you can see here. The beautiful photos possess a hint of high-dynamic range, even though they aren’t actually HDR images. They have a nice dramatic ambience to them. 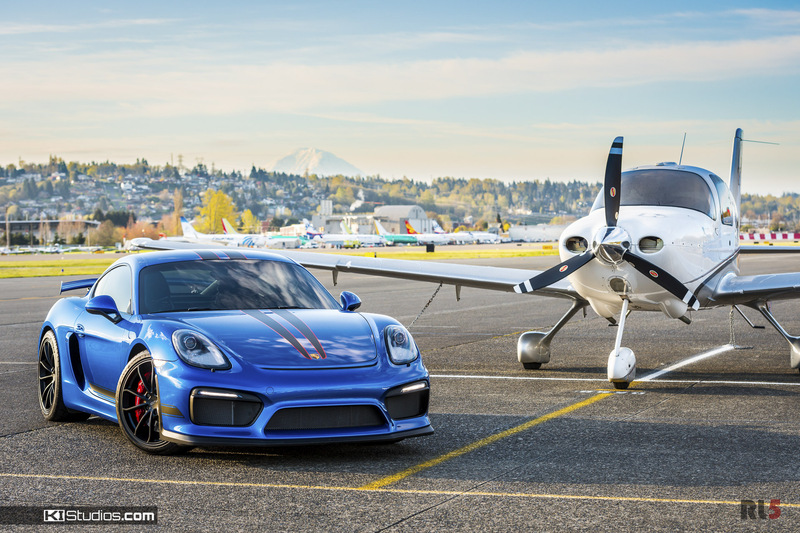 The winning photo is the cover photo with the Porsche and the plane in the frame. We love the composition of the piece. We would’ve preferred a bit less glare from the hood of the car, possibly by using a different orientation on a polarizer filter. Still, the rest of the shot more than makes up for that bit of glare. If you didn’t realize it yet, the focus is on the top stripes. 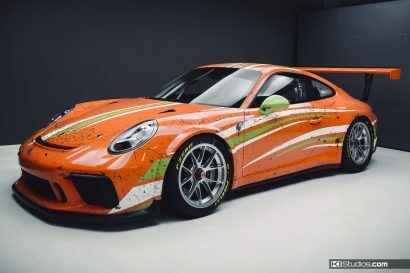 However, look more closely and you can see that the car also sports our side stripes kit 001 for GT4 with the no text option, also in matte black. It really does add a nice finishing touch to the look of the car.